In 1997, a small agency named Medya Park was founded by an ambitious business man and a creative mind. Then, we united our powers with a problem solver. Thus, we started to draw our path: below the line advertising. A year later, in 1998, we saw an opportunity to be the first in Turkey. We started to provide promotional products to Advertising and PR Agencies. As time passed by, we have incorporated three company into our structure for the purpose of being with our clients from the idea stage to the final product: REKPO, projects and organizations, KARAGON OFFSET, printing house and OZTURK ADV, indoor and outdoor sign production. Now, after all these years, there is no such thing as "Impossible" for us. Who is the Chess Men? It is the symbol of creative mind and solution. It is the symbol of possibilities. It is the symbol of dedication. 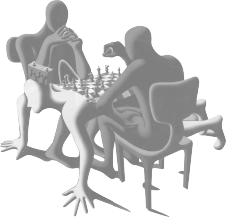 The Chess Men is the symbol of how we work.